The Habsburg dynasty was one of the most powerful in Europe from the early 13th to the early 19th century. It was also a major power in cultural matters. It attracted the best musicians and composers to serve at its courts. The Habsburg rulers loved music, and some were skilful players of various instruments and acted as composers. It was a profusely-branched family which resulted in many composers and musicians being connected in one way or another to members of this dynasty. This disc focuses on Charles VI who was Holy Roman Emperor from 1711 until his death in 1740. It was the final heyday of the imperial court in Vienna, with two major figures as Kapellmeister and vice-Kapellmeister: Johann Joseph Fux and Antonio Caldara respectively. The G.A.P. Ensemble wisely presents its programme as "music from the reign of Charles VI of Austria", and not music written for or performed at his court. Often we do not know exactly when music was written and for which occasion. Giovanni Antonio Piani is a good example of a musician who worked at the court in Vienna for many years but whose only extant music dates from before 1721, the year he entered the service of Charles VI and became one of the highest-paid musicians at the court. The twelve sonatas for violin and bc op. 1 were published in Paris in 1712. It was only recently that his music was brought to our attention by the same musicians, albeit not under the name of G.A.P. 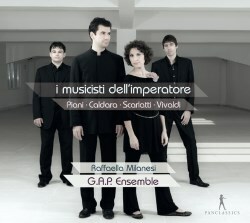 Ensemble - the initials actually refer to Piani's name. In my review I expressed my admiration for Piani's sonatas, and my positive impressions are confirmed by the three sonatas played here which extend the number available on disc to seven. They are largely modelled after the Corellian sonata da camera. The collection is historically important because of dynamic indications such as crescendo, diminuendo and messa di voce. Antonio Caldara was Charles VI's favourite composer. The Italian-born master had set his eyes on a position at the court in Vienna from early in his career, and after some failed attempts succeeded in entering the service of the emperor. When he died in 1736 the bells of St Stephen's Cathedral rang as they only did when rulers were born, married or were buried. Caldara composed a large number of works, especially oratorios and operas, for performance at court. Whether his cantata Risoluto son già, tiranno amore dates from his time in Vienna is impossible to say. His large corpus of chamber cantatas - at least around 300 - has not been sorted out as yet. The fact that imitative counterpoint plays a significant role in this piece - as in his oeuvre in general - was one of the factors which must have attracted Charles VI as the Habsburg emperors were rather conservative in their musical tastes. The violin plays an important role here, as it does in the other two cantatas. Both Alessandro Scarlatti and Antonio Vivaldi were connected to the Habsburg dynasty in a more indirect way. Scarlatti was from Naples which had been under Spanish rule but then came into the hands of the Emperor. In 1708 he was appointed chapel master by the Austrian viceroy in 1708. He was the most prolific composer of chamber cantatas in Italy, mostly for soprano and bc, but sometimes with additional instruments, such as in Appena chiudo gli occhi. He also laid down the standard texture of the chamber cantata: two pairs of recitative and aria. However, he sometimes departed from this form, and that is the case here too as the cantata starts with an instrumental introduction. The recitatives include some chromaticism, in the first for instance on the word 'tormento'. The first aria is rather long: about seven minutes, and is the most expressive part of the cantata, both in the vocal and the violin part. Vivaldi was also interested in a position in Vienna, but never managed to attain an official post. However, Charles VI was full of admiration for the composer, whom he once met personally. Twice Vivaldi dedicated a collection of concertos to the emperor, one of them his op. 9, 'La Cetra'. From 1718 to 1720 Vivaldi was employed as maestro di cappella da camera at the court of Mantua which had been annexed by the Habsburgs in 1707 as the result of the Spanish War of Succession. Charles VI installed Prince Philip of Hesse-Darmstadt as his governor. Vivaldi composed a little more than forty chamber cantatas, mostly for soprano or alto with basso continuo. In some he added instrumental parts, either strings (two violins, viola) or a single instrument, such as the recorder or the violin. In the second aria of Lungi dal vago volto the violin has a virtuoso part which includes double-stopping. That is the only well-known piece on this disc. I have already referred to Piani's sonatas as music which only recently started to be discovered. Caldara's oeuvre is hardly explored as yet, and every piece which sheds light on the qualities of this master is most welcome. Scarlatti's corpus of cantatas is an inexhaustible source: he composed more than 600. Many of them are of outstanding quality and highly expressive, and that includes the one performed here. In Raffaella Milanesi's performances the dramatic and expressive qualities of these cantatas is perfectly conveyed. It is just a shame that the booklet omits any translation of the text which is a serious shortcoming. Even so one cannot fail to note Ms Milanesi's skills in the exposition of the emotions in the recitatives and arias, for instance in the subtle crescendi and diminuendi in the last aria from Caldara's cantata. Particularly expressive passages are effectively singled out, and the recitatives are taken with an optimum of rhythmic freedom. These positive features make it all the more regrettable that she didn't control her vibrato more carefully. The instrumentalists act at the same level: Emilio Percan is again an engaged advocate of the music by Piani. I hope that he will have the opportunity to record the remaining five sonatas some time.